Hi, June. It’s a good question. As you know I correspond with John re the OS; I think John pretty much knows my viewpoint. Anyway, here it is: Essentially, to paraphrase Robert Browning, Ah, but a man’s reach should exceed his grasp, but not on the Ocean Shore. (Perhaps to replace the slogan “Reaches the Beaches”.) The idea of a railroad along the coast was a good one–thought of years before– but the carrying out was not. The OS was under-capitalized at the outset. Too much money was wasted as it turned out on double-track construction wiped out by the 1906 earthquake, and on electrical equipent and facilities never used, since after that event the line was forced to switch to single-track steam operation. The idea of starting to build simultaneously from San Francisco south and north from Santa Cruz was poor planning, especially in view of the shortage of funds. It forever remained, as someone said, two branch lines. A single track steam line beginning from S.F. would have reached the fertile valleys of San Gregorio and Pescadero as well as the timber resources of the Butano Forest area before running out of money.Then, with an income-producing operation the OS more easily could have widened to an electrified double- track, if still desired, and gone on to Santa Cruz. (I realize this is hindsight, but the unrealistic optimism of the promoters should have let a bit of room for foresight.) The grandiose plans for real estate opportunities and suburban play land type developments wasted additional funds. For them it was not build it and they will come–just the opposite. True, bad luck did not help–the earthquake for example as well as the financial depression that began almost as soon as the OS started out. And management obsession–to build along the ocean’s edge insofar as possible–undoubtedly increasing construction as well as roadbed maintenance costs. In 1906, the rolling hills of San Mateo seemed an unlikely site for an English fox hunt, replete with traditional riding regalia, fine horses and a full complement of hounds. All that was missing was the fox. This did not deter the resourceful Peninsula aristocrats. If local foxes were scarce, coyotes weren’t. From a distance, the men and women astride galloping horses looked like specks of red and black, impressionistic figures on the San Mateo landscape. Attired in red hunting jackets, white breeches and black caps, they were members of the San Mateo County Hunt Club. As “master of the San Mateo Hounds,” John Downey Harvey, the 46-year-old president of the Ocean Shore Railway, gathered around him the “regulars.” Thesemembers included Harvey’s daughters, Anita and Genevive, his friend, attorney Francis Carolan, banker Richard Tobin and polo players Captain Seymour and Walter Hobart. The Burlingame Country Club was the meeting place for the “drag hunt,” which resembled a fox hunt, except the hounds were trained to follow an artificial scent. As the riders and their hounds nervously awaited the start of the meet covering 15 miles, none of them dreamed that a month later, the San Francisco earthquake and fire would change many of their lives. The Peninsula’s great water mains would collapse as San Mateo County sustained wide quake damage. On the Coastside, boulders would tumble over Devil’s Slide into the foaming surf, followed by the twisted remains of the Ocean Shore Railroad’s freshly laid track and expensive rolling stock. As owner of 13,000 shares of the railway, Downey Harvey was the driving force behind the first railroad to promote a 5 ½ – hour trip as a moving picture ride down the San Mateo County Coastside, featuring views of cliffs, bluffs, beaches, rocks, redwoods and marine scenery. Born in Los Angeles on April 17, 1860, J. Downey Harvey was the son of Colonel Walter and Eleanor Harvey. His uncle, John G. Downey, was the seventh governor of California, later a business partner of Alvinza Hayward, whose mansion once stood near Ninth Avenue in San Mateo. As a youngster, Downey Harvey displayed a “genius” for acquiring friends. In school, he befriended the son of Pio Pico, the last governor of Alta California, who, with his family chose to reside in Los Angeles. Harvey also knew John C. Fremont, a popular, nationally known figure, and a promoter of railroad projects in the West. In 1883, 23-year-old Downey Harvey married Sophie Cutter; the couple raised two daughters, Anita and Genevive. Sophie Harvey loved music and a full social calendar, yet she managed to run her large household with efficiency. By 1895, Downey, an avid sportsman, reportedly laid out Northern California’s first golf course for the San Francisco Golf and Country Club. When he learned that San Mateo County, because of its “undulating pasture without pebbles,” was the best terrain for the hunt, he focused his efforts on helping develop the San Mateo County Hunt Club. Polo player Walter Hobart had a place in the hunt club’s lore. In 1897, he purchased 38 foxhounds, shipping them from New York to San Mateo for the first “authentic” chase. The San Mateo County Hunt Club members pursued Hobart’s hounds across the fields in a “drag hunt,” the animals chasing a sack of anise seed, a flavoring used in alcoholic drinks called “cordials.” The hunt ended when the hounds surrounded the aromatic sack. Disappointed that their quarry was not alive, the hounds had to be rewarded with stewed beef. As for the hunt club members, they rode back to the Burlingame Country Club for cocktails and dinner, followed by a big party. Their aristocratic English fox-hunting cousins would have found many deficiencies in the San Mateo club’s version of the hunt. One one occasion the “clever huntsman” Jerry Keating unleashed a large pack of hounds, so many that they were in every field, in every direction. Making matters worse (or perhaps more exciting), so-called “unauthorized horsemen” (folks who “just” enjoyed riding) put themselves between the hunters and the dogs. Foiling the scent with their steaming horses, they tested the patience of the master of the hunt, ruining the chase. Ocean Shore Railway President J. Downey Harvey learned from Jerry Keating’s mistakes, and he never brought along too many hounds. Harvey had always displayed an interest in horses, as did his close friend San Francisco attorney Francis Carolan. Married to Harriet Pullman, heiress to the railroad car fortune, Carolan loved his equine friends, but it was more than just a hobby. Offered top dollar for Vidette, one of the best jumpers in the country, the attorney repeatedly refused to sell his favorite hunting horse at any price. Upon completion of the Carolan’s Crossways Farm, a Burlingame residence with stables and a private polo field, the couple celebrated with a spectacular party held inside the stables. Flower-draped chartered Pullman cars carried guests–the men attired in red hunting jackets–from San Francisco to the Burlingame farm. Thousands of Japanese lanterns (perhaps to show support for Japan, then at war with Russia) and electric lights lit up the grounds, and a multi-colored chandelier had been installed in the stables, according to the archives of the San Mateo County History Museum. To get a powerful boost of illumination, including a string of lights outlining the house, wires were strung all the way from Burlingame to Redwood City. Cocktails and supper were served at tables placed near the brightly lit stables; entertainment included a Japanese ballet and Spanish dancers. The Carolans became famous for the renowned French chateau they built in Hillsborough in 1915 — abandoned by them seven seven months later — when the rattling windows and other annoyances undermined their shaky marriage, causing them to abruptly leave the Carolans and each other. As a major shareholder of Ocean Shore Railroad stock, it was natural that Downey Harvey would think about the railroad’s difficult construction near Devil’s Slide, north of Montara on the Coastside. Building a railroad along the coast route from San Francisco to Santa Cruz had been strewn with obstacles. 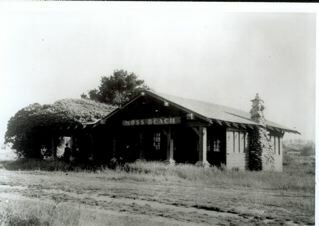 Forty years earlier in 1865, the Atlantic and Pacific Railroad Company surveyed the possibility of a Coastside railroad, creating an air of excitement in Pescadero and Half Moon Bay. Thousands of workers were slated to fell trees, excavate cuts, string bridges and bore tunnels. Suddenly land prices doubled….but the bubble burst, and the railroad was not built. Millionaire miner Alvinza Hayward, who built a mansion [later turned into a hotel] in San Mateo, spent $17,000 surveying a railroad, doing some grading and securing rights-of-way. His plans suddenly were dropped because of bad investments. Other planned railroads failed as well. In 1905 the San Mateo Times, fearing interference from the Western Pacific Railroad, called for their choice, the Southern Pacific Railroad (SP) to take action. The SP'[s engineering department responded that a surveying party had begun, and the company was acquiring the rights-of-way. The SP’s efforts came too late, for Downey Harvey and his independent group of Ocean Shore Railway investors had outmaneuvered the competition. proudly showed visitors a $1,250 Persian rug–a lavish gift reportedly from Downey Harvey, thus greasing the skids for the Ocean Shore Railway being awarded the coveted San Francisco franchise. In 1906, a month before the earthquake struck, the San Mateo Hunt Club members, hot on the trail of the hounds disappeared into the tree-lined Howard Woods where a “coyote was liberated and killed by the pack.” The hounds backtracked over the same course while Downey Harvey and the other hunters rode to the Burlingame clubhouse where they enjoyed luncheon on the verandah. The day of sport had not ended for polo players Captain Seymour and Walter Hobart; these men galloped off for a polo match at Francis Carolan’s nearby private polo field. A month later, on April 18, the San Francisco earthquake struck. As president of the Ocean Shore Railway, Downey Harvey convinced San Francisco’s mayor to form a Committee of Fifty to provide relief for the homeless, but his own losses were beyond calculation. 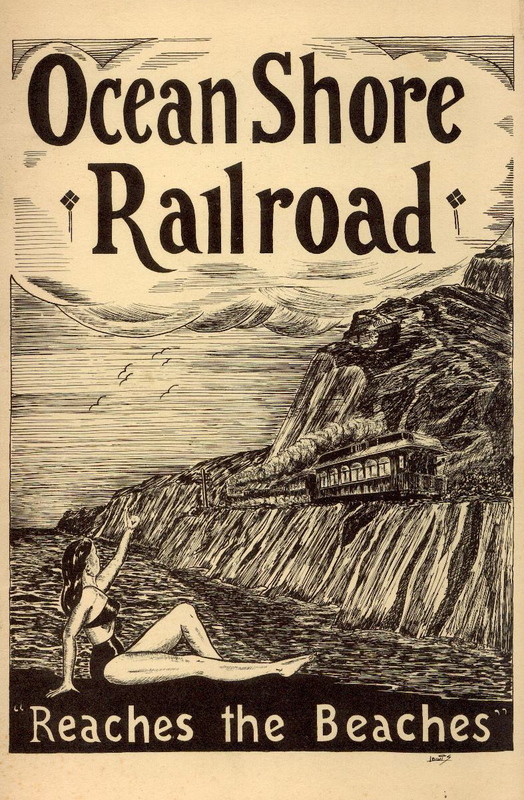 Author Gertrude Atherton wrote that her friend Downey Harvey had invested the greater part of his fortune in the Coastside’s scenic railway–but after the earthquake there was little interest in scenic railroads and new resorts. The Ocean Shore limped for4ward but the Harveys had lost so much money in the railroad they were forced to live in a sort of retirement for awhile. For the Downey Harveys, such a retirement meant living at Del Monte, the exclusive resort built by the Southern Pacific Railroad at Monterey. Upon his return to San Francisco, Downey Harvey faced lawsuits resulting from the tragic death of an Ocean Shore train conductor. The OSRR finally closed down about 1922. J. Downey Harvey, whose affiliations included the Bohemian, Pacific Union, Olympic and San Francisco Golf Clubs, was “the most human of human beings,” said a friend after his death in 1947. “He had the wisdom of a fox and honesty of a sunrise. I wrote this story some years ago. 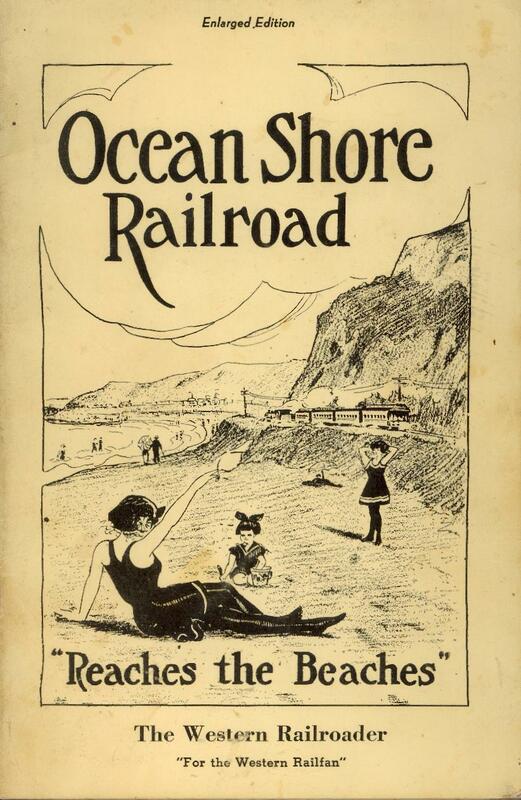 Thank you for posting the Ocean Shore Stanley Steamer piece and the information about our new Petaluma & Santa Rosa Railway book. We enjoy your Coastside history articles. Much more history is lost than is saved. You are certainly doing your part to save it. As “master of the San Mateo Hounds,” John Downey Harvey, the 46-year-old president of the Ocean Shore Railway, gathered around him the “regulars.” These members included Harvey’s daughters, Anita and Genevive, his friend, attorney Francis Carolan, banker Richard Tobin and polo players Captain Seymour and Walter Hobart. The Burlingame Country Club was the meeting place for the “drag hunt,” which resembled a fox hunt, except the hounds were trained to follow an artificial scent. 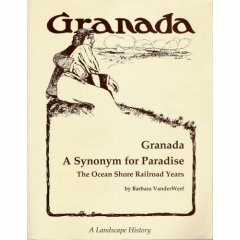 These were published long after the Ocean Shore Railroad expired by the Western Railroaders.